The Colonsay Hotel is open, Easter celebrated, and chocolate eggs searched for, found and eaten. For the island the new season has begun. April is typically the month when, with lengthening days, the sun beats back the last lingering darkness of winter and the island throws off the last weeds of hibernation. After a brief rush visitors over Easter and then a quiet pause, travellers increasingly arrive to explore a land newly revealed and renewed. The sun, whose arc is steadily rising higher every day, glints off the fresh young flowers on the machair to welcome those early seasons walkers, as likely as not locals, enjoying the lengthening days. As the month progresses the pace of the island begins to quicken. Quicken at least as far the gentle pace of the annual Book Festival, which comes at the end of the month, and with it the trickle of visitors grows to a steady flow. Still time and space enough for all to enjoy the beauty of the island bathed in Spring sunshine. And how to capture the serenity, beauty and power of Colonsay to move the soul after a long cold winter? Here is a link to a video made by Emma Skeldon that catches the vibrant, natural spirit of our Hebridean isle. With fewer applicants than seats available there was no need for an election to the Community Council, and David Hobhouse, Alex Howard, Jane Howard, and Keith Rutherford were automatically returned as councilors. The first meeting of the new council is to be 7thMay. 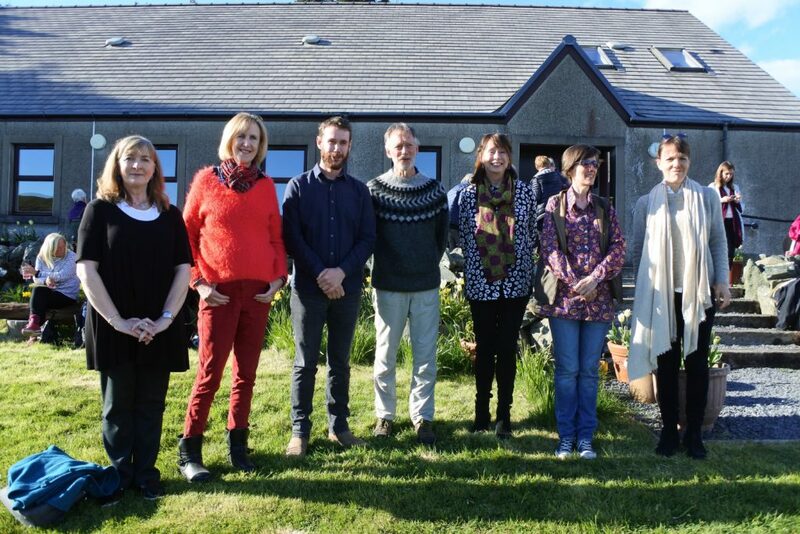 The 7thAnnual Colonsay Book Festival was held over the last weekend in April. The festival has become established as the island’s first festival of the year and continues to attract both leading authors and a loyal following of visitors. The festival has retained its small, intimate nature which makes it individual, even unique, and much loved both authors and public alike. The weekend followed the well-established format of 6 authors split over two main sessions, one each on Saturday and Sunday afternoons, with fringe events around these main sessions. The festival kicked off on Saturday morning with AL Kennedy giving a reading of some of her children’s books, which attracted local children and more than a few adults. After enjoying a light lunch provided by Helen Mann and her team, festivalgoers sat down to an afternoon of diverse literary pleasure. First up was Bella Bathurst in conversation with Alex Renton about her book Sound, then poet John Glenday followed with readings from his books Grain and The Golden Mean, and the afternoon finished with crime writer Lin Anderson reading from a selection of her works. On Saturday evening there was a literary pub quiz. Something of a tradition for the festival, this one proved to be as tough as they come, and enjoyed by a packed crowd at the Colonsay Hotel. 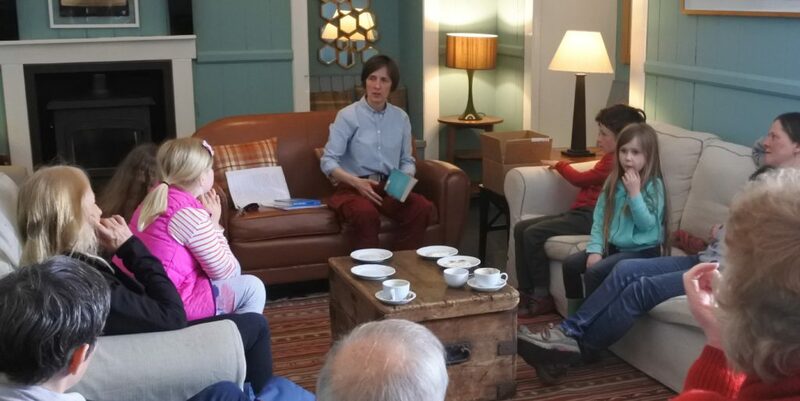 On Sunday morning the old dinning room at hotel was full for an informal session by Jenny Brown, talking about what makes Scottish books sell in the global market. The late April sunshine was hard to resist, but the Sunday afternoon session was full for Malachy Tallack, introducing his book on imaginary islands. After that, Janice Galloway read from her selection of short stories, Jellyfish. The last author for the festival was AL Kennedy, who also read from some of her yet to be published short stories. 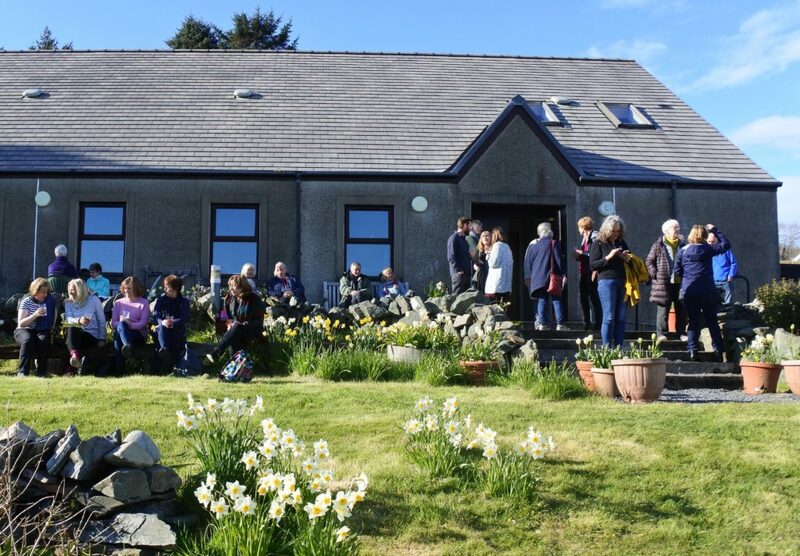 With Wild Island Gin to close the festival it was another successful weekend for Colonsay’s own literary festival. Colonsay’s school continues to thrive with April 2018 School Newsletter reporting on pupils activities and successes. The pupils have had notable success with publication due for poems entered into the Little Riddlers and Rhymecraft completions. In the run up to Easter pupils re-enacted the Bible story, after earlier in the term celebrating World Book Day. In March the Parent Council put on an “Italian Night” and in April an “Easter Ceilidh, both at the village hall, to raise funds for the school. Both were a great success with the Italian Night raising over £700.